So with the New Year upon us, many of you are feverishly racing to the gym, clearing out your garage, or telling yourself you'll finally start actually caring about your mundane office job. Well those are all valiant wishes, but let's face it, the over/under on them all is around February 15th. So when it comes to New Year's resolutions, count on your old pal Stan to throw some low hanging fruit your way. You know I've got you all covered when it comes to computer repair in Los Angeles, and today I'm gonna take it one step further. 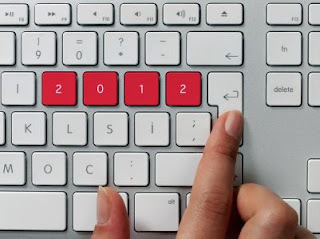 That's right dear reader - I'm giving you some Tech Resolutions for 2012! Let's start with the basics. If you're running an obsolete old computer, it's time to put it out of it's misery. Not sure? If you suspect it to be obsolete, it probably is. Need a litmus test? If you've got a Windows XP PC or a PowerPC Mac, it's time to stick a fork in it. Retire the old POS. We'll be happy to help you transfer the data. Let it go. Life's too short to wait around for an old computer. TABLET TIME. Come one, you know you want one. You've been eying it. You may have even touched one. You've convinced yourself it's no big deal. But, secretly, you've been craving one and 2012 is the year to make it happen. Whether you're into Apple, Android, Amazon, or Windows, there's something out there for you. Get one now. You can thank me later. Back it up, back it up, back it up. Repeat this mantra until you actually go out and get yourself a solid backup plan. Either online or local, preferably both. Back you stuff up and you won't be one of the countless folks who show up at our shop on a regular basis crying over an unrecoverable hard drive. Do it now. Do not pass go. Do not collect $200. Get your Internet connection right. Your Internet access is like being in love - if you think it's slow, then it's soooooooooooooo slow. Call your existing provider - you don't know how many customers I've gotten speed upgrades for free simply by calling. You could be stuck on a legacy plan that's long since been upgraded, and all you have to do is ask. Or if you're in a spot where DSL speeds simply can't touch cable, it may be time to switch. And while you're at it upgrade that old router - it simply can't handle the high speed wireless networking that new computer you resolved to get craves. And finally - take some time to learn, really learn how to use that computer. Take a class, ask a friend, read a book, read my blog, email me, whatever. But get an idea about what you're working with. The capabilities are endless. Really figure out how to use Google - all the answers are there. No seriously - regardless of the computer problem you're experiencing - a simple Google search will undoubtedly yield hundreds of results leading you to the answers you seek. Try it out. It's really revolutionary. So there you have it folks - the easiest bunch of New Year's Resolutions you could ever ask for. So take my advice and start the New Year off right with some brand new tech. In 2012, with God as my witness, you'll never have to wait around for your computer again!